On December 30th, 2018, Tyche Shepherd tweeted a brief summary on the general size and state of the Second Life main grid. The surface level reading in the summary is good: overall, the grid increased in size by 2.1% – the first such increase since 2011, leaving the grid at a total of 23,811 regions at the end of December 2018, compared to 23,337 at the end of 2017. However, where private regions are concerned – still the major revenue earner for the Lab – things were far more modest: just 14 regions up on the year, from 16,106 to 16,120 – a 0.1% growth. The rest came from Mainland, up 460 regions to 7691, thanks largely to the arrival of the SSP continent. Note the December 2018 monthly tier level reflects a growth of just 14 regions (most likely mixed between Full and Homestead), having minimal overall impact based on the margin of error. The increase in private region is likely – as Tyche points out – due to the Lab’s downward adjustment in private region fees, announced in June 2018, and which came into effect as from the start of July 2018. 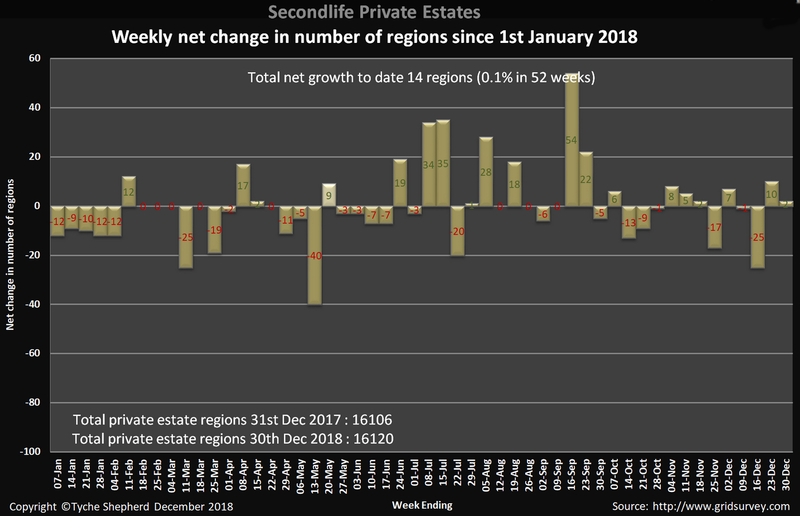 Certainly, this was followed by an upswing in demand totalling 69 private regions over two weeks, although it might be argued that overall, the fee changes can’t yet be judged to have moved the grid into a sustained level of growth. In fairness, the reduction in costs for private regions wasn’t going to result in a massive upswing in demand. For one thing, the 15% reduction in monthly tier for a Full region – as I noted at the time – wouldn’t see people stampeding to get a region of their own. Thus, outside of events, etc., demand for land still largely lays with those in the land rental business, particularly given Homestead availability remains tied to having at least one Full region, and how well they are perceived as passing on the lower fees through reduced rental charges to customers, which itself could be complicated. Although all that said, it might have been hoped things came out a little stronger by year-end than has been the case. So, what might we see in 2019 in terms of land? Well, it’s unlikely Linden Lab will move towards another reduction so soon after that of July 2018, simply because more time will be required to analyse the overall outcome in terms of overall outcome. However, there are other things that will be forthcoming in 2019. As noted, the largest growth in regions is the SSP continent (384 + a testing region). It’s no secret this is likely the new Linden Homes continent, due to come on stream in 2019. What is still to be seen is how they will be offered, how they might help generate revenue, and what effect they might have on the grid. For example, will they replace the existing Linden Homes entirely and be offered within the current Premium subscription package and ultimately intended to replace the existing Linden Homes continents? Will they form part of a new Premium subscription offering, sitting alongside the existing Linden Homes continents? If they are to completely replace the existing Linden Homes over time, what might be the logistics for doing so and for “retiring” the existing LH continents? Might we see more than one new Linden Homes continent deployed in the coming year? 2019 may well also see a large part of the Lab’s work in transitioning Second Life to the cloud. Even if this is completed by the end of the year (which is probably optimistic given the massive complexity of SL, but we’ll see), it’s also unlikely to lead directly to any adjustments to land fees or the release of new products, simply because, again as the Lab has indicated, they’ll need time to bed things in and ensure everything is running as anticipated and – equally importantly – experiment to see what (if any) kind of product options might be available and how they might be priced. For my part, I suspect the sine wave we’ve seen in the second half of 2018 will likely continue, undulating between losses and gains, with a possible bias towards the positive side of the line. But that said, I didn’t foresee a fee cut for private regions coming in 2019, and actually expected numbers for the year to decline (albeit far more slowly than previous years); so what do I know? 🙂 .